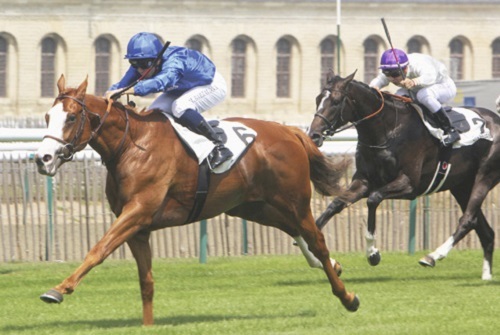 JAMES CUMMINGS Australian Godolphin team has been boosted by the addition of two quality French Stakes performers. Cascadian and Beau Ideal raced for Godolphin under legendary trainer Andre Fabre who last year was crowned France’s Champion Trainer for the 29th time. Cascadian was narrowly defeated in last year›s 1600m Group 1 Prix Jean Prat at Deauville, a 3yo feature race won by Intellogent on the famous straight track. Beau Ideal is a precocious son of Australian sire Exceed And Excel, winning two of his three juvenile starts including the 1000m Listed Criterium de Vitesse at Chantilly. Godolphin’s French representative Lisa- Jane Graffard told Jour de Galop both horses experienced “minor health glitches” during their 3yo season and confirmed both horses would continue their careers in Australia. “We’ve had good results with horses that we’ve sent there from 1400m to 1600m,” Graffard said. “There is a good programme over this distance range in Australia with races that carry very good prize money.” Cascadian has raced six times for three wins and two seconds but ended his European stint on a flat note, well beaten into eighth in the 1600m Group 1 Prix Jacques le Marois at Deauville behind European Champion Filly Alpha Centauri. Beau Ideal has also raced six times, for two wins and three placings. He didn’t miss a top two finish as a 2yo and his highlight performance came on his return as a 3yo when charging from midfield to finish a neck second in the 1100m Group 3 Prix Texanita at Maisons Laffitte.